Forest Service Prelims Examination 2018. There are total 106 vacancies available in Government offices of Madhya Pradesh filled only through Forest Service Examination 2018. Eligible candidates can apply for these posts through online via the official website of Madhya Pradesh PSC @www.mppscdemo.in. Online Applications starts from 18-12-2017 to 08-01-2018. 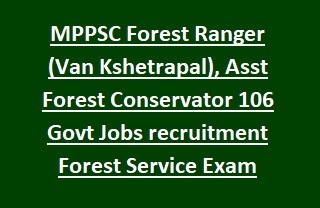 MPPSC state Forest Service Exam will be conducted to recruit candidates for MPPSC For more details like Available Vacancies, Eligibility Criteria, Exam Pattern, Selection Process of Madhya Pradesh Public service commission MPPSC Forest Ranger (Van Kshetrapal), Forest Conservator Recruitment 2018 are given below. Click here for official Notification of MPPSC Forest Service Exam 2018 Notification. Online Application process starts from: 18-12-2017 (12.00 PM). Online Application Process Ends on: 08-01-2018 (12.00 AM). Modifications Last date is 10- 01- 2018. There are total 106 vacancies available in Madhya Pradesh PSC Current Recruitment. 1. Forest Ranger (Van Kshetrapal): 100 posts. 2. Forest Assistant Conservator: 06 posts. Candidates applying for these jobs must have completed Graduation/Degree with Science or related B. Tech Degree in any of Agriculture/Horticulture/Physics/Chemistry/Zoology/ Engineering/ Mechanics/ Forestry subjects or its equivalent from recognized university/ Institute. For additional qualification details please refer MPPSC official Advertisement. Candidate should have age limit of 21 years to 28 years for State Forest Ranger Jobs as on 01- January 2017. For SC/ ST candidates age relaxation will be given as per MP Government rule. Monthly Salary for MPPSC Forest Ranger Jobs is Rs. 9300 to Rs. 34800 plus GP of 3600/- and for Forest Conservator posts Rs. 15600 to Rs. 39100 plus GP of 5400/-. Application fee for General category candidates is Rs.500/- plus postal charge Rs. 40/- and for SC/ ST/ PWD is Rs. 250/- plus postal charge Rs. 40/-. Selection for this MPPSC recruitment will be held through MPPSC State Forest Service Examination. Forest Service Examination will be conducted in four stages. For Male Candidates-25 Meters Walking for both the posts. Preliminary Examination will consist of 2 papers. Paper I comprises General Studies will cover General Science and Environment, History of India, Indian Polity & Economy, Sports, Geography etc. Paper 2 comprises General Aptitude questions (Interpersonal Skill, Comprehension, General mental ability, Logical reasoning & analytical ability etc.). For additional details of Syllabus and exam pattern please visit MPPSC official Notification. Eligible candidates apply through online from Madhya Pradesh PSC State official website @www.mppscdemo.in. Fill the form and submit before last date 09 May 2017. Please share this Madhya Pradesh MPPSC Forest Service Exam Notification 2017 article to your friends through online via social web.